Bhubaneswar: Classes at the eight Model Degree Colleges established in educationally backward districts in the State will start from the current academic session with the Higher Education department releasing the list of subjects to be taught in these colleges on Saturday. The Model Degree Colleges were opened in Malkangiri, Nabarangpur, Rayagada, Boudh, Deogarh, Nuapada, Subarnapur and Nayagarh districts. Three streams like Arts, Science and Commerce will be there in these colleges. As per the notification, while 160 seats will be there in Arts and Science streams, 80 seats will be available for Commerce stream. Besides the compulsory subjects like English, Odia, Environmental Studies in the three streams, Honours subjects like Economics, Education, Sociology, Political Science, and Anthropology will be available in Arts stream while Honours facility in the subjects like Physics, Chemistry, Mathematics, Botany and Zoology will be available in Science stream. Commerce honours subjects will also available in these colleges. The gross enrolment ratio (GER) in these districts is lower than the State’s average of 11.3 per cent , which the Government intends to improve to 30% by 2022. The colleges are to come up under the Central Government’s Model Degree College (MDC) scheme, mooted during the UPA-I regime for the country’s 374 districts with poor gross enrolment ratio (GER). The GER is the number of enrolled students as against every hundred eligible students. The State has currently 720 degree colleges with a capacity to admit 2.16 lakh students. Forming a Higher Education Task force is good development by the state Government. We the members of KDDF, herewith drawing your attention for the consideration of the following matters for the development of higher education in various centers of western Odisha viz. Sambalpur, Bargarh, Kalahandi, Balangir, and Suderdarh. 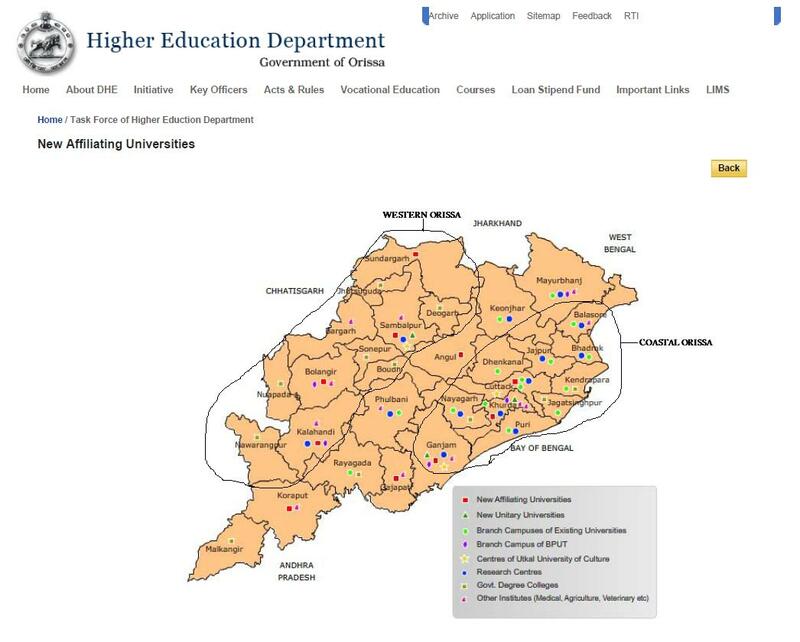 Politically, western Odisha or Koshal region of Odisha has been seriously neglected in higher education, most of the new central Government institutions are coming in Cuttack-Bhubaneswar and South Odisha region and not a single one is established in Western Odisha which lacks sufficient number of higher educational and research institutions despite consisting a vast area and population. The state Government has at the last moment betrayed for a Central University in Kalahandi and ignored demand of IIT in Sambalpur. Recently ESIC medical college was also not feasible in Balangir whereas National Steel Institute was established in Puri instead of Sundergarh. The continuous political neglect towards Western Odisha should be stopped for the betterment of this region in Higher Education. Without improving present infrastructure Gross Enrolment Ratio (GER) in Higher Education will never enhance. Most of the major colleges in Western Odisha are being neglected by state Government. Presently, there are many regular vacant faculty posts existing in G. M. Autonomous College Sambalpur, Government Autonomous College Bhawanipatna, Panchayat College Bargarh, Rajendra Autonomous College Balangir, Government Autonomous College Sundergarh etc. In fact condition of higher education in Western Odisha is further downgraded in last 10 years by directly affecting GER. For example, Government Autonomous College Bhawanipatna (GACB) has 38 vacant regular posts at this moment unlike a decade ago. There were 8 faculties serving in Chemistry Department of GACB a decade ago and now only two of them are serving for the whole college. Same is the case in other departments and colleges in western Odisha. Without adequate number of faculties how GER in higher education will improve? We propose that immediately in next one year sufficient number of regular faculties is recruited for the above colleges in Western Odisha on regular basis. As state Government claims most of the time faculties from other parts of Odisha are unwilling to serve in Kalahandi, Balangir and other region of western Odisha, therefore, regular faculties in this region should be recruited in the local level through local level tests opening the possibility for candidates from the whole state. G. M. Autonomous College Sambalpur and Government Autonomous College Bhawanipatna were among first three colleges along with Raveshaw Autonomous College Cuttack chosen by UGC as “Potential Centre of Excellence” in Odisha. Ravenshaw Autonomous College was converted to a Unitary University by the state Government which helps in its growth and getting UGC funding, whereas both G. M. Autonomous College Sambalpur and Government Autonomous College Bhawanipatna are still being neglected by the state Government, these two colleges should be immediately converted to Unitary Universities. Similarly Panchayat College Bargarh, Government Autonomous College Sundergarh and Rajendra Autonomous College Balangir should be expanded to full-fledged educational institutes by opening PG courses including Computer sciences, Management, Biotechnology and Nursing. Since Western Odisha lacks of sufficient number of higher educational institutions and opening new campuses is as expensive as establishing new institution, establishing new central and state Government institutions and upgrading present existing institutions to higher level would be beneficial for Western Odisha in general. A branch of Central Rice Institute should come-up in Bargarh. An Indian Institute of Management should be established in Sambalpur and steel institute in Sundergarh. National University should be established in western Odisha. Along this line, keeping sentiment of Kalahandi people, the proposed National University in Bhubaneswar should be pursued with the Central Government to establish in Bhawanipatna, Kalahandi. Also, we urge you to establish the proposed Health University Balangir. BPUT in Rourkela should be converted to a full-fledged science and technology University having education and research in the line of Anna University Chennai. Similarly, Agriculture College at Bhawanipatna should be converted to a full-fledged Agriculture & Animal Husbandry University. The Harishankar and Gandhamardan mountain provides adequate atmosphere to have a University for Ayurvedic and Herbal Medicine. We urgue to combine Sri Nrusinghanath Ayurvedic College, Paikmal, Bargarh and the Government Ayurvedic Colleges in Balangir and establish University of Ayurvedic and Herbal Medicine. VSS medical college should be pursued to be made an AIIMS type institution. The following new institutes need to be established in Western Odisha or Koshal region on the regional basis. -Combine Sri Nrusinghanath Ayurvedic College, Paikmal, Bargarh and the Government Ayurvedic Colleges in Balangir and establish University of Ayurvedic and Herbal Medicine along the line of National Institute of Ayurveda (http://nia.nic.in/). This institute can have two campus one at Balangir and other one at Bargarh. -A branch of Central Rice Research Institute, (http://crri.nic.in/) should be opened at Bargarh area to promote agriculture, in particular rice cultivation as the Bargarh-Sambalpur area is considered as “rice bowl” of Orissa. – Establishing a unit of National Council for Cement and Building Materials (NCB) (http://www.ncbindia.com/) along with private partners in Bargarh as this institute can have multiple units. Apart from the main center in Delhi; it has its units in Ahmadabad and Hyderabad (http://www.ncbindia.com/units.htm). Bargarh has many cement factories it will promote a lot in expanding expertise in areas like cement manufacturing and building materials. -GM College needs to be upgraded to a unitary university. -Jharsuguda area has lot of Industries and going to have many more in future. A Council of Scientific & Industrial Research (CSIR) lab like National Environmental Engineering Research Institute(http://www.neeri.res.in/index.php) should be established in this area. This institute aims to strive providing scientific, industrial research and development that maximizes the economic & environmental and social benefit for the people. -Branch of Institute of Forest Research should be established in Deogarh (see http://www.envfor.nic.in/icfre/icfre.html). Deogarh will be a suitable place for this location; it has dense forest with natural environment. It will be a suitable location for branch of forest research Institute. Ushakothi (Badrama) Sanctuary is also close to Deogarh.